A brick packed full of riffs, 6 string bass, excellent drum fills, weird noises and bizarre time signatures. Now imagine being hit in the face with this brick. 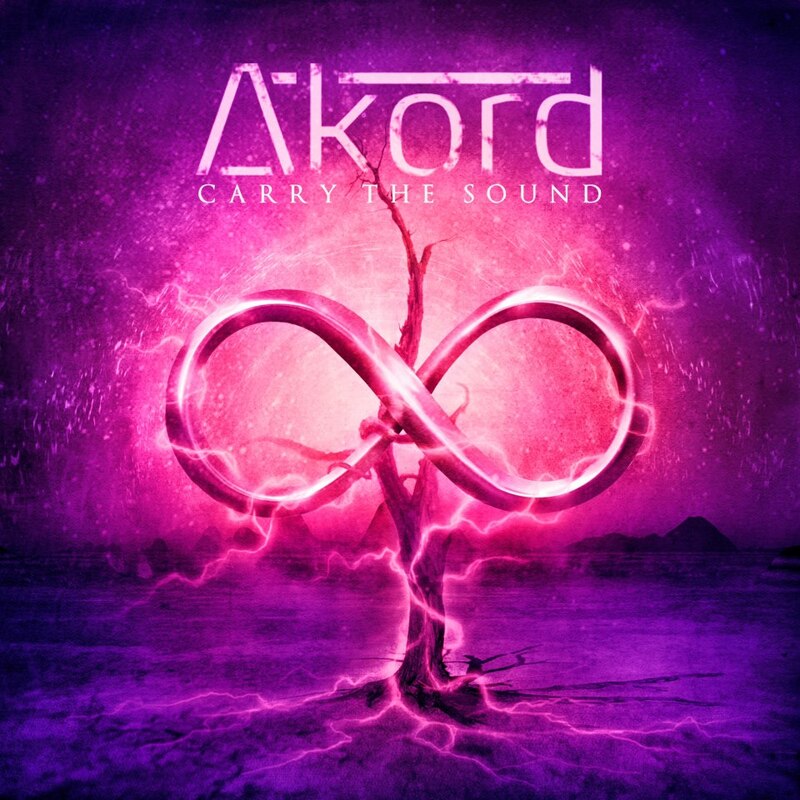 Now you can appreciate what Akord have created with their 'Carry the Sound' EP. On first listen, you can tell straight away that time was taken, and they really have put their blood, sweat, tears and who know's what else into making the finest record they could. Most local EP's I've heard have really poor production quality; Akord were clever and recruited Nick Scholey to do all the dirty work here - mighty fine decision. You can tell they worked hard, every part of every song is interesting and well thought out. Opening track 'Houdini' is a mash of full heavy guitars, stomping drums and smooth vocals. Sandy sings in very laid-back manner, with effortless harmonies which completely contrasts the voluminous guitars which really fill your ears. There are so many layers to this song, and is best appreciated with a good set of headphones. 2:11 - The section hits you like a fecking tidal wave of sound and vivacity. Listen loud. The song is a tale of sorts, it has a protagonist, whomever that may be, who we are told all about and it leaves you wanting more. Like any good story should. 'This Day' I. Love. The. Start. Of. This. Song. This intro sounds as though you should be listening to it whilst floating through space. Definitely Death Star elevator music. It's stompy, hard hitting and has an excellent chorus melody. I love it; they seem to manage to create pretty epic, intense thought provoking music. You can hear the Karnivool influence in this track, but they still have something wonderfully unique. 2:40 onwards has a beautiful section of vocal work followed by a wall of guitars you can't ignore. It's heavy, exciting and leaves you wanting soooo much more! Probably my favourite track on the record, if I HAD to pick, is 'Light the Way (+Indifference)'. I was lucky enough to hear the first edit of it, and it made me well up. I don't know why, it's not something I can put my finger on, it just has an energy to it that works for me. Vocally, maybe not the strongest but has some amazing parts; listen out for the inflection in his voice right on the last word of the song - stunning. The start is calm, lying on a beach sort of calm, but no wait, it all kicks in and it's time to pack up the towel and stomp away. This song is a bloody journey from start to finish. Even though it's called 'Light' the Way, I feel, musically, it gets a bit darker as the song progresses; more intense. The premise of the song is relate-able 'No wrong, no right, it's just a choice of path'. A journey of a song, about the journey of life..
2:55 pretty epic section, including a party beat. A PARTY BEAT. I love a good one of those. 4:10 a quiet section, drums akin to a heartbeat. Hooked onto the end of this song is a segue to the next track. A short, exciting piece of music that includes guest drumming from Robbie Mackie of Fonik and producer Nick Scholey. I'm not going to say much about it as it really speaks for itself. 'Set In Your Life' booms on next, and what a track. 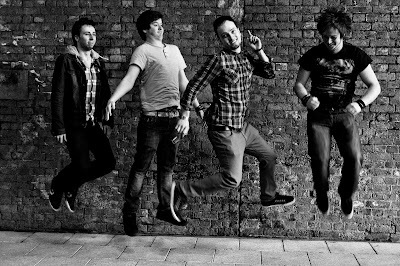 This was Akord's debut single, which allowed them to storm their way to the winners spot of the Kerrang! Big Audition competition. I've already reviewed the single, so you can enjoy it by clicking here. 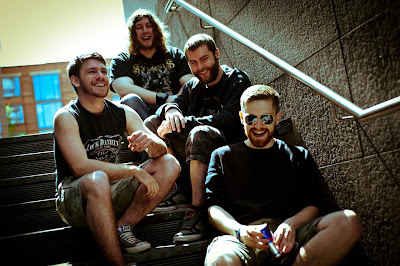 Rounding off this record is 'Carry The Sound'; the track that is currently allowing them to be in the finals of the Red Bull Studios competition to win a slot at Download Festival. What a way to finish the record, this song has so much bloody emotion in it it's crazy. Sandy's vocals are superb and Arran manages to make his guitar fecking cry at one point I swear to god (4:55). This song has something for everyone, sing-along-to melodies, gang vocals, crazy time signatures, mad guitar effects. You will most likely hear something new every time. A bit of a work of art this song. Wouldn't you agree? That they bloody well do. My biggest critisism is that it wasn't long enough. Really looking forward to the next one. Putting Aberdeen firmly on the musical map, two bands from the Granite City have battled their way to the top 15 of a competition to play this years Download Festival; the biggest rock festival in the UK. In a lovely riff-tastic fashion, Akord and Semperfi have pushed past over 700 bands, and guess what? – Not only are they a step closer to playing the same festival as some of rock’s biggest bands (Iron Maiden, Rammstein, Slipknot! 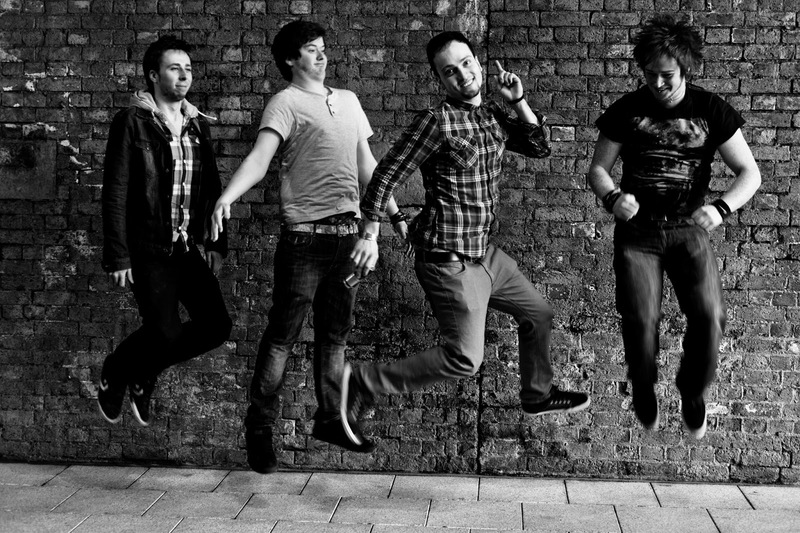 ), they are the only two Scottish bands in the competition! With them both hailing from Aberdeen, this is bloomin’ marvellous, not only for the bands, but for the city! Following a luxurious trip to London, both bands were given the opportunity to record a song, channel their inner models in a photo shoot and get some valuable industry advice. Their visits were captured in their own 2 and a half minute video, which can be viewed on the Red Bull Studios website (http://download.redbullstudios.com). The competition is heating up big time, and both bands need your help. They need votes, Facebook shares, tweets. Basically, the bands need you to speak, eat, sleep and breathe about them. It’s all about the hype folks. Sharing is caring. So, time to get promoting, let’s show the world what Aberdeen has to offer, and it starts with these two fantastic bands. Dont forget to like 'Little Bird' on thee old Facebook, click here! I've always been a day-dreamer. When I was a kid, I was constantly imagining myself in some alternate fantasy having bizarre adventures - they usually involved pretending to be a fairy with my friend Pie (she was always a talking dog....). Pretty sure we managed to convince ourselves we were actually fairies at one point.. I spent a good amount of time in my car pretending I was piloting a TIE Fighter; partly due to boredom, partly due to epic music. Do you ever hear a song, and it immediately transports you to some other place? I have this annoying habit of hearing a song and imagining which scene in some imaginary movie it would fit best. I don't know whether it's my over-active imagination or the song-writer has succeeded in conveying the emotion they set out to proclaim. I sometimes hear a song and it hits me like a wall of emotion; not necessarily the lyrics, but the music. The words may have nothing to do with the place it takes me; sometimes it's the vibe of the song that can be enough to cause me to well up, or get my heart racing. I do this a lot. It mostly happens in my car or when I'm walking with my headphones on. I love it. Pretending for a small amount of time that I'm in a film; I'm running away from some crazy drama or I'm off to save the world! As soon as I first heard this song I kinda froze. It's so beautiful. To me, it' sounds desperately sad. I think it's a love song of sorts; but I truly don't know. It talks of 'two strangers turning into dust' - maybe a sad goodbye? I don't know. I just know that when I heard it, it took me to a sad scene in a film; the idea of losing someone close and struggles that follow to come to terms. Things moving in slow motion. Makes me sad when I hear this. I don't like feeling sad, but I like this song. God, this piece of music is beautiful. I am a bit of a gamer, however I have never played the Dead Island games. I saw the trailer for it, and this music made me want to cry. If this was in a film, I would imagine the main protagonist walking away from a terrible accident, where they had lost someone or something close to them. There would be tears, blood and it would be gut wrenching. The kind of emotion whereby it's hard to breathe but all you want to do is scream. I don't know, but I love it, I love it, I love it. Ah, Blue October. This band will most likely have a whole post to themselves at some point as they hold an immensely special place in my heart. This song is madness, and I don't need to use my imagination too much. This song speaks for itself, and is a terrifying, sick tale of a desperate man. I love the intensity of the story; described by lead singer Justin as a tale of 'how people can be taken to that point where they would actually harm another through jealousy and pride...'. Upon listening to this song, you can so clearly picture every single moment as it is described. It gave me chills when I first heard it. I love this band. They're pretty fabulous. This song, straight away fills me with excitement; it gets my heart racing. It's the kind of song that can cause you to accidently speed when driving as you get so caught up in it. Through the various layers of this song and the delay effect on the guitars I am taken to some sort of chase/escape scene. I don't know why really. It must be the madness of this song. I imagine running or driving really fast, escaping from a life you no longer want. Amazing song. I have started doing some writing for 57 Degrees North (http://57north.org/), a local project aimed at promoting local music in the north east of Scotland. There are a lot of hidden gems up here and I think it's important that they have a platform to be heard. I like to think I am honest when it comes to talking about music, and I am going to strive to give an honest opinion of the bands/artists I am asked to talk about. The first artist I spoke to is a young singer-song writer called Charly Houston. My review for the 57 site can be seen here (LINK), but I also wanted to post a version here since I have a tendency to ramble... (jjjeeeeezzz, every time I write that word I start singing Led Zepplin, every bloody time....). Hailing from the land of the weegies, Charly Houston has travelled north to inject some soul into Aberdeen’s local music scene. She brings with her a laid-back acoustic sound, somewhat comparable to the likes of Emma’s Imagination, Amy Macdonald and even James Morrison; a very mature sound from someone so young. Her voice is extremely soulful, with a beautiful tone through it and it’s refreshing to hear - something a bit different from the typical ‘Girl-with-an-acoustic’ act that we have all seen before (they're literally everywhere....). Charly’s new EP is set for release on the 17th May, which I feel is perfect timing with the ever brighter weather. This 5 track record feels like the sorta music you would listen to on a summer road trip, or whilst relaxing in the garden under the sun. It’s a deep, loving and sometimes sad record but ultimately I feel people will relate to this in one way or another. The songs are personal to her but I feel fellow students who have moved away from home for their studies will hear something familiar in her words. Her mature attitude towards her music is sure to stand her in good stead for the future. 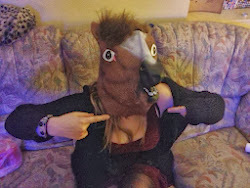 Having listened to earlier recordings, you can appreciate how much she grows and develops as an artist from track to track (look out for ‘Brian’ on her Soundcloud by the way - awesome), and I feel she will continue to progress and it will be interesting to see what she brings us next. I would love to hear her really push herself vocally; there's a lot of soul in there yet! I know she has a laid-back singing style, but I really think she could do a looottt more with that voice - I look forward to hear it develop over time. Her voice is soft with a bit of rasp and you can hear some lovely inflections throughout. 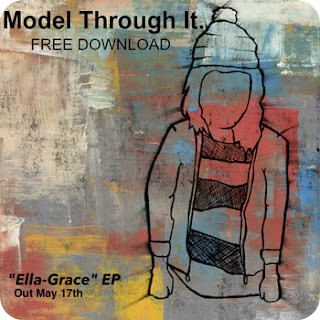 So her new EP Ella-Grace will be celebrated with a launch night on Friday 17th May at the Tunnels, be sure to check it out and show local talent your support! Every musician will have an idol, whether that's a band, a solo artist or even a street performer they once walked past and gawked at. They will have grown up listening to various artists and even various genres which will have one way or another shaped they way they approach their own musical adventures. I am really interested in finding out about this; everyone has their own unique background story. Heck, my boyfriend who is bloody intense about his music went through a phase when he was younger when he absolutely hated music and wouldn't listen to it. Now, he's completely immersed in it. I'm now in my early 30's and I'm thinking, how did this happen? We're meant to be young forever right? No-one warned me it would happen (they did), but happened it has. As I think back to my musical past, the bands I've been in, the songs I've written, and the music I've been into all these years, I realize there's so much in there. Out of the albums I own and love to listen to, what could I say is my favourite? Do I even have one? Yesterday evening myself and a friend of mine (A Chirs Pontius lookalike, also in his 30's and I'd say a typical South Wales metal head) took a walk up Mynyddislwyn (Islwyn Mountain) en route to the the Church Inn Pub to sink a few pints and to thrash out our musical opinions. During the walk up we talked about whether Margaret Thatcher was good for the country, the pros and cons of capitalism and that the Manic Street Preachers had recorded their early demos in a small studio somewhere around here . Well, we didn't come to a conclusion on politics but we did share some memories of youth and music. I'd say there are many ways to think of music and albums. There's the music that has shaped me musically, influenced my singing and guitar styles, such as Yes, Pink Floyd, Deep Purple and U2 (My Dad had a big impact on my childhood listening habits). Then there's the albums and bands that have a profound emotional connection, which can take me back to my teenage years in the 90's, that gets me all excited and nostalgic. That's what I'll talk about now. You may well be thinking, how original?! A Welshman that likes the Stereophonics. Well I can counteract that stereotype with, I don't particularly like Rugby and none of my family have ever worked down a coal mine. However, the one stereotype that may well be valid here, and I've already mentioned this in my Nirvana piece above, is the fact that it is a very sing along kind of album. We do love a good sing song. "Check My Eyelids For Holes", "Last of The Big Time Drinkers" all amazing sing along tracks. Not only that, when this album was released I hadn't long turned 18, so it was around this time I was heading out to the usual Alternative venues of the Newport scene such as TJ's (legend has it Kurt Cobain proposed to Courtney Love here, I have no idea if that's true) and Le Pub. This album, I feel that I can identify with the sentiment and what these guys are about. It was an exciting time for welsh music. I know we had the Manics (I do love James Dean Bradfield's Voice and his guitar work) but the Stereophonics, I think, are perhaps a little more accessible. I felt that they were just like me and my friends, valley boys (2nd stereotype). Another Live album (mostly) and again containing many of their classics from Joshua Tree and also cover versions of Beatles and Bob Dylan. I would’ve been 8 or 9 years old when this was released. I think it pretty much past me by, as did most things, including Bros (yuck) & Kylie Minogue (yum). This album, along with the film that was released along side it, I discovered a few years later. It was around 1992, I started to learn guitar after watching Guitar Legends. This was a series that ran on BBC 2 and part of the Expo 1992 from Seville, Spain. There were all sorts of guitarists from blues to metal. Two of my favourite guitarists from this live series was B.B. King and Steve Vai.....anyway I’m off topic a little. I liked U2 anyway but when I saw the Rattle & Hum film and B.B.King was playing with U2, that sealed it for me. I was into blues when learning to play guitar, and this album does go back to the USA’s Rock n Roll Roots. My favourite track of this album, without doubt is “Bullet The Blue Sky” and it’s way better than the studio version, though having said that, I’m pretty sure the live version is overdubbed quite a bit, but I don’t care. I love the fact there’s slide guitar in there, funk riffs, a rolling bass line and vocals which are almost spoken in places, it’s also quite dark. Now, are these really my favourite albums? Well maybe, maybe not, I don’t think I have one. If you asked me to write about this next week, I could well have come up with different answers. As far as The Kennedy Soundtrack goes, I’m sure we were all trying to get our influences into that album. That’s why it is so eclectic. Of course there were other bands and musicians just from my point of view that I haven’t mentioned, but there’s also four other individuals in The Kennedy Soundtrack that brought so much to the mix. Their musical choice’s are probably a whole lot cooler than mine, though we all made our mark.